Sooner or later, if you use your 4x4 off-road, you are going to get stuck. If you haven't try harder! Of course if you've had your 4x4 modified by us maybe it's your mate that got stuck trying to follow you. Either way you are going to need some recovery gear. 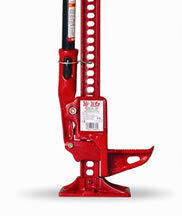 this can take the form of a winch (mechanical or electrical) or some form of rope or strap. IMPORTANT: It cannot be stressed enough, that the use of winches and other recovery gear can be very dangerous, due to the serious forces involved, if not done correctly. "Ambitious. Advanced. Tough-as-nails. Revolutionary technology fuels the best winches on the market today. No-compromise construction, extreme sealing and the highest in performance and reliability make them a perfect match for the serious off-roader. Backed by the WARN Limited Lifetime Warranty." Exhaust operated air jacks or bull bags. Winching gloves for handling steel rope. Drop us a line or give us call and we can put together a kit that to suit you, whether you are travelling a desert or just a weekend off-roading. WARN M8274-50 - one of the fastest and prefered by the competition guys.